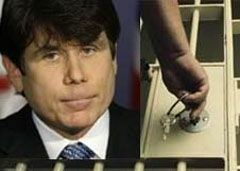 The re-sentencing for former Illinois Governor Rod Blagojevich was held today in Chicago. He appeared by video from the Federal Prison Camp in Englewood where he is serving a 14 year sentence. The resentencing was the result of the appeals court vacating five of the most serious counts against him: the ones that pertained to the alleged "sale" of the Senate seat. The 7th Circuit Court of Appeals heard oral arguments Friday in the appeal of former Illinois Gov. Rod Blagojevich. Blagojevich's attorneys had to be happy that the panel raised questions about the heart of their defense that the attempted sale of a U.S. Senate seat was political horse-trading and that prosecutors had unfairly made it into a crime. Does that bode well for Blago? Impossible to know. Predicting how an appeals court will rule is usually a futile exercise. The "Walmart of Weed" is opening in Washington, DC, just blocks from the White House and federal buildings. Lindsay Lohan is released from supervised probation with praise from the Judge. She still has two more years of unsupervised probation. 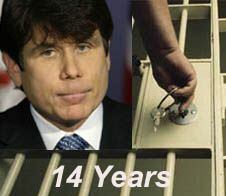 The Bureau of Prisons has posted Rod Blagojevich's release date: May, 2024, 12 years from now. 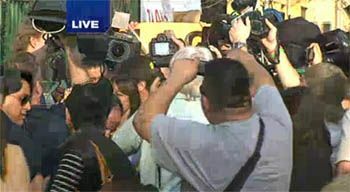 Update: The longest 60 seconds of Blago's life is probably this walk (video)from the car into the prison. Via the Denver Post, here's his real welcome crew. 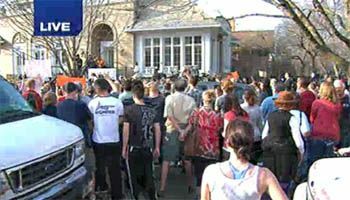 The media circus surrounding Rod Blagojevich continued today as he flew commerically to Denver and made his way to FCI Englewood. Followed by helicopters and television news crews on the road that brought to mind the low speed chase of O.J. Simpson, Blagojevich arrived at Chicago’s O’Hare International Airport. A mob of travelers took photographs on their cellphones as Blagojevich, his arms raised, stood in a body scanner before heading to down the concourse. 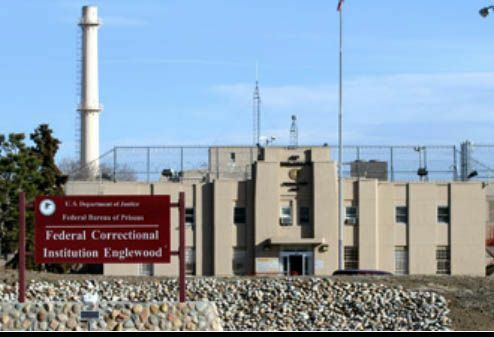 Via NBC News Chicago, above is the video of former Illinois Governor Rod Blagojevich's goodbye press statement before heading off to prison at FCI Englewood (photo here) in Colorado tomorrow . Patti is with him. The house is mobbed by media as well as onlookers and supporters. He is incredibly upbeat, Patti looks absolutely devastated. 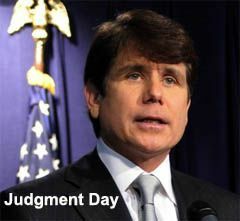 Rod Blagojevich begins his 14 year prison sentence on Thursday. At 5 pm CST today, he will hold a press conference at his home. The next morning he will fly to Colorado with his attorney, and surrender at FCI Englewood, a low security level prison outside of Denver. There will be many saying Blagojevich got his due. I think the sentence is too harsh. He's neither violent nor a safety threat, the conviction ended his public career and ostracized him. He's broke. His daughters will grow up without a father. One day he's here, next day he's not. The judge presiding over Rod Blagojevich's criminal case has agreed to recommend the Bureau of Prisons admit him to RDAP -- the residential drug and alcohol program that allows inmates who successfully complete it to cut up to a year off their prison terms. The news is reporting he asked for drug treatment even though Blago's attorneys gave no reason for the request. Also the reports state Team Blago asked he be placed in the program when he starts his sentence. Blagojevich isn't eligible for a camp because his sentence exceeds 10 years. So a low security facility is the next best thing. Englewood is pretty decent. Lots of clients want to go there. (Here's the Commissary list. )It also has an adjacent camp which he can get to when he does qualify. He may even find friends there. Enron's Jeffrey Skilling is serving his sentence at Englewood, and he doesn't get out until 2028. A judge's recommendations are not binding on the Bureau of Prisons, so it's not a certainty that's where he will go. Bed space may play a role. The judge also extended Blago's surrender date until March 15, to give him more time to sell his home. Former Illinois Governor Rod Blagojevich has been sentenced to 168 months, 14 years in prison. He will be allowed to voluntarily surrender on Feb. 16. Since there is no parole in the federal system, only good time, he'll do about 12 years. Former Illinois Governor will get a chance to speak to the Judge before sentence is pronounced today. After so many years of legal travails, he's got to be running on empty. I'm hoping the judge will decide on less than 10 years. If he gives him 84 months, it sends a message, is big punishment, will still wreak havoc on his family, but at least, with good time, allow him to return home in time for his younger daughter's high school graduation. I think 5 would be a fairer sentence, but I don't see the judge getting to that level after his comments today. The sentencing hearing of former Illinois Governor Rod Blagojevich is underway. The judge has said he won't rule until tomorrow. The best place to follow is Twitter. This morning the parties debated the sentencing guidelines. The Judge sided with the Government, finding the criminal activity was extensive, Blago had a leadership role and he tried to get $1.5 million for the senate seat. That puts the guidelines at 30 years to life. "It should be noted that I agree with the government and the defense for that matter that the guideline that is correctly computed for this of 30 years to life is simply not appropriate given the facts of this case."